UPDATE: The website now has a history of the church and directory of locations which are attempting to become independent churches. While the year began with much joy, 2014 was a year marked by trials, tribulations, and ultimately—transitions. Facing mounting criticism as the church investigated formal charges against him, Pastor Mark Driscoll submitted his resignation as vision and preaching pastor on October 14, 2014. If you want to get some last minute Mars Hill information put aside, now is the time to do it. Multiple sources are telling me that the website content will be unavailable at midnight eastern time. As we now know, at least some of the sermon content will live on at markdriscoll.org. Google cache will have some available for several days but the Wayback Machine is hindered by the ever-pesky robot.txt. Not sure about the social media but I suspect those accounts will be gone as well (e.g., You Tube, Twitter, Facebook). The church has lots of business to conduct so it really can’t legally go away until the final dissolution. I have some more stories and information which I will add to the record in the coming days. Readers can also use this post as an open forum on the last days at Mars Hill. Maybe MH Insida will make an appearance before he goes off to party. In any case, please keep it civil and respectful of each other. Readers in Minnesota’s state House district 33B (Saint Paul), your representative, Cindy Pugh, is plugging the theocratic Institute on the Constitution. Post by Institute on the Constitution. Among other assignments, Pugh sits on the Higher Education and Finance committee. The IOTC course is riddled with errors and so it is disappointing to see it get a high profile endorsement. Some interesting news in this article about the new Cross and Crown Church (formerly Mars Hill Ballard). For those keeping up, the article is a brief update on Ballard. According to the report, the Evangelical Credit Union, who is financing the building, wants to see fewer paid staff on the leadership team. There is content which comes from Justin Dean’s new company Doxa Media (for instance this image on the “Get” tab). Mark Driscoll’s new website has been down since the 27th after I reported that it was a copy of marshill.com. This morning Janet Mefferd tweeted that Driscoll’s new organization, Learning for Living, is trademarked by Alistair Begg’s Truth for Life organization. I became aware of that last week and wrote Truth for Life for comment. Today, I spoke to someone at the organization who declined to comment but was aware of the issue. The person who is able to comment was not there today. The phrase is also trademarked by the non-sectarian Learning for Living Institute. I don’t really know how this works since according to the search results two organizations have the same phrase. There was no response from the Institute to my inquiries before I posted this. In any case, I don’t know if the trademark issue is the reason the website is down or if it relates to a clean up of the Mars Hill code issue raised over the weekend. As Garrison points out, Kappas (if it is the same one) is head of Grace Global Network. He has been with Driscoll since the beginning of his ministry, according to Wenatchee the Hatchet. Koleoso preached at Mars Hill’s best sermon series and is pastor of Jubilee Church in London. He was the speaker at Bellevue when former members protested outside that Mars Hill location. The address is a post box (517) at the UPS store there. You can read all of the articles on Mars Hill Church here. The most popular post this year written prior to 2014 was a 2009 post on the relationship between child abuse and homosexuality. Another popular this year written in the past was a post on David Barton’s distorted story about Congress and the first English Bible printed in the United States. Even in God’s garden of grace, broken trees bear fruit. According to someone who heard the message, Warren said this while showing a picture of a fallen tree with eight new trees growing out it. For many, Mars Hill Church was not a broken tree. They made their nest in that tree and are mourning today as it will no longer function as it once did. For others the tree was diseased and broken, a source of pain. While some of them may celebrate, I suspect that most of those who had anything to do with the church will also feel some sadness and grief. In all my interviews, I have met only a handful who wanted to see the church close. Most wanted to see change and stories of redemption and correction. Actually, the church doesn’t cease as an entity on December 31. There are buildings to sell and resources to distribute. There might be mediation or a lawsuit to settle. There will be donation statements to mail out. Speaking of money, there will be offerings to count and process. My source said that one of the pastors stood up and asked for money after Rick Warren’s sermon. Fitting. But videos will go away and churches will become local. Over time we will find out how many of those trees growing from the fallen one will live. Below is about two minutes near the beginning of the sermon. There may be more of the message later. At the end, just before communion and singing the last three songs, Alex Ghioni leads the request for offerings. In fairness, I know the concept he was going for but the image doesn’t work well for those who believe Mars Hill was, on balance, not a good tree. At least he is sorry about something. Concerning the website, MarkDriscoll.org – nothing on that site is being hosted or paid for by Mars Hill. If there’s anything in the source code that indicates otherwise, it’s because the site is a copy of marshill.com with most of the functionality and code stripped away. The site is on its own servers and was handed over to Pastor Mark. The domain is also registered to Learning for Living, not Mars Hill Fellowship. Mars Hill originally purchased that domain many years ago and has now turned it over to Pastor Mark. It takes time for the Whois information to update, which I believe it is now. Since Mark’s site is just a copy of marshill.com there a probably a lot of links to Marshill.com that remain, but it doesn’t mean the church is hosting content for him. After 12/31 those links will be broken if he doesn’t change them. As for who approved or what was paid, I have no idea. That would be private information. I no longer represent Mars Hill as my last day was 12/24/14. The “Welcome Pastor Mark Driscoll” shows up on the page but the content not displayed is in the black borders above and is from the Mars Hill Church website. As noted above, Dean did not know who, if anyone, had given permission. In any case, it appears that Mark Driscoll has derived additional benefit from a church he no longer serves. That domain is one that Mars Hill has had registered for quite some time but we never used. It has now been transferred to Mark Driscoll, and the domain registration to Mars Hill Fellowship is outdated (I believe it is now updated). The site is in no way affiliated with Mars Hill Church or Mars Hill Fellowship. It is not affiliated but it was copied. All sermons, articles, blog posts, text, graphics, user interfaces, visual interfaces, photographs, trademarks, logos, sounds, music, artwork and computer code (collectively, “Content”), including but not limited to the design, structure, selection, coordination, expression, “look and feel” and arrangement of such Content, contained on the Site is owned, controlled or licensed by or to Mars Hill Church, and is protected by trade dress, copyright, patent and trademark laws, and various other intellectual property rights and unfair competition laws. *I originally called Justin Dean a spokesman for markdriscoll.org but that is not correct. I am sorry for the misunderstanding and incorrect information. 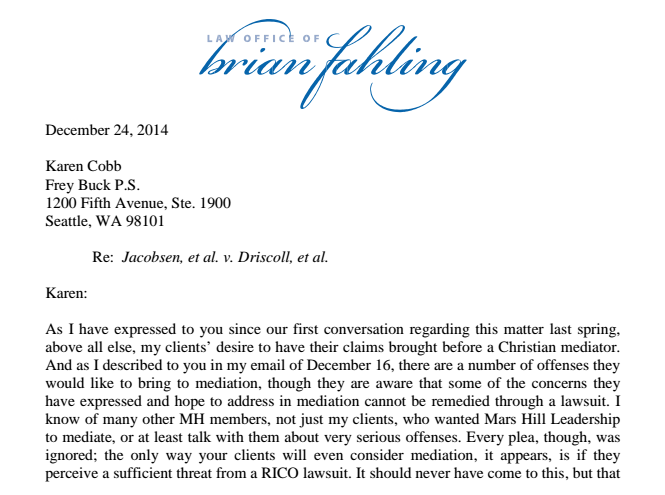 I have obtained a letter from attorney Brian Fahling to Karen Cobb, attorney for Mars Hill Church. Fahling represents several plaintiffs who allege various offenses, some of which are public claims covered by federal racketeering statutes. The letter, dated December 24, specifies the legal case against Mars Hill. The plaintiffs would like to mediate but Mars Hill Church leaders (not sure who all that includes right now) have not agreed, according to the letter. For this post, I am simply going to post a link to the letter and then add commentary afterwards as I am able. I will note that there is Global Fund time line in this letter that is intriguing and that I am going to spend some time reviewing. A legal fund to support mediation or a lawsuit has been established. For Fahling’s letter, click this link. It is hard to understand how the leaders of Doxa are behind this when some of them are still involved in keeping information quiet at Mars Hill Church. However, this communication to church members is a breath of fresh air. In addition to other items, this memo addresses several questions that have been placed before Soma leadership. We have shared for the last couple of months a prayerful desire for the new church, now named Doxa Church, to be one that is characterized by shared leadership and transparency in finances. It is our intention to be held accountable to the congregation, and to walk in the light with respect to our decision-making and spending. The purpose of this post is to address the topic of transparency and the level of disclosure you should expect to see in financial communication from our new church. In some sense, this is family business that is quite detailed. It may not be important to some—but it will be very important to others. Thus, we wanted to address these issues in a public manner. As Doxa Church, we believe that the congregation is better served if the people are informed and equipped to ask questions, share concerns, or voice affirmation. We are committed to providing access to information that includes the monthly summary level data shown below, as well as more detailed monthly and year-to-date revenue/spending reports. An annual audit will be conducted by an independent public accounting firm and their audit report, together with the accompanying financial statements, will be made available at the church office and online. Specific financial statement line item detail will also be made available to our members, upon request, at the church office. We will hold an annual business meeting with the full church, but also want to be available to answer your questions each Sunday and through regular open Q&A sessions. We will also, as per our bylaws, inform the congregation of any purchase that would be over $100k and describe both the nature and the need for the expenditure. Following discussion and prayer, we would then seek a vote of the congregation to move forward. Our accounting, payroll and other books and records will be maintained by an outside accounting service. As you would expect, Doxa Church provides financial support for staff members in order that they can be freed up financially to focus on equipping others for ministry. In the specific context of Bellevue, Washington, this leads to salaries that may appear higher than some surrounding areas. However, we believe these salaries are reasonable given the nature of our workplace and context, when compared to national salary surveys for similar positions in similar sized churches. No employee will receive any compensation prior to January 1, 2015. Following January 1, 2015, employees will receive a salary as described above and benefits including insurance and participation in a 403(b) plan (the retirement plan offered by tax-exempt organizations). Doxa Church will begin regular operations on January 1, 2015, and will be the recipient of “seed money” from Mars Hill Church as a replanted church in Bellevue. This “seed money” comes in two categories: (1) start up costs and (2) a final gift. The start up cost category represents the tithes and offerings Mars Hill Church members gave in the last few months as the new churches, like Doxa Church, were being created. The amount is intended to approximate three months of operating expenditures. We are planning to use this money to fund and offset some of our start up costs in the first year. The second category, a final gift, would come from any residual balances after Mars Hill Church liquidates its assets and pays off its obligations. At this time, there are simply too many variables to know the timing and/or amount of this final gift. The elders of Doxa have made the determination that we will live within our own means. Specifically, we want to support this new church based upon the giving we receive from our members and attendees of Doxa. That is why we are not budgeting to use the latter category of “seed money” mentioned above in the daily operations of the church. To the best of our ability, we will use these funds to build cash reserves and save for the future. We will prayerfully consider how to allocate those funds with wisdom, integrity, and full disclosure once their timing and amount are known. We also want to be clear that no Doxa Church funds will be going to Mars Hill Church. We are receiving “seed money” because Doxa Church was birthed out of two former Mars Hill locations, however, there are no financial ties or obligations from Doxa to Mars Hill. Doxa’s ability to stay in our facility and hire staff is, in part, made possible because the budget model of our church is very different than that of Mars Hill Church. Mars Hill Church existed as one church in many locations, which meant that a significant portion of giving went to help other church locations. In the Doxa model, as one church in one location, we have the ability to make independent decisions. The congregation’s generosity thus has an even more direct impact on the people of this church family. These percentages include start up cost category “seed money” from Mars Hill Church described above, without those funds the percentage breakdown is 35%, 46%, 9%, and 10%, respectively. We will share more details of this budget in the new year, once we have a clearer picture of giving and expenses, but wanted you to be aware of the framework within which we are making current decisions. Doxa Church leadership has made the determination to stay in the current facility (John Danz Building) through the remainder of the lease term (October, 2017). Mars Hill Church would have paid the full remainder of the lease to leave—something that we, together, believed would have been poor stewardship. Through discussions with our landlords, we came to a mutually agreeable solution—that, in essence, Doxa Church would simply continue on with the lease, but with no penalty payment. The new lease contains a 12 month notice clause—meaning after notice to move, our landlords would be able to redevelop the property. However, the property is no longer under contract and there are no current players in mind for this redevelopment. Our monthly payment (including auditorium and office lease, parking, and common area maintenance) will be $82k. To offset some of this cost, and because we desire the partnership, we will host classes from Western Seminary, who will be paying for use of the space to hold weekly graduate-level classes. We do not yet know what might happen after October, 2017. However, we believe that staying in this facility is a sustainable choice that also allows the members of the church to have time to heal without the pressures of relocation, and to prayerfully consider a longer term plan for a future church location. It is important to note the difference in church model between Mars Hill Church and the Soma Family of Churches. Mars Hill Church was one church in many locations, which meant operating from one church budget and with one central governing body. The Soma Family of Churches is made up of many independent churches with a shared vision. The network is currently comprised of twenty-four independent churches with no legal or financial obligations existing between them. To be clear, while we will work toward affiliating with this body at some point in the future, financial resources of Doxa will be stewarded by the elders of Doxa Church. There may be times we choose to help our brothers and sisters in Christ at Soma or another local church, but those decisions will be made out of love, prayerfully led by the Spirit, and not out of obligation. Your elders and staff desire regular communication and want to be both transparent and accountable. When questions come up, you are welcome and encouraged to bring those inquiries to any of the elders. I will be serving as an elder and as the Director of Administration, and will most readily have access to specific details. Thank you for your continued prayers, support, encouragement, and faithfulness. I realize that the leaders of Doxa may not feel any obligation to address unfinished business at Mars Hill Church. However, I believe that since some of the leaders are the same at Mars Hill and Doxa, Doxa should now acknowledge the unfinished business and indicate what former Mars Hill leaders are doing to address those issues. Pentatonix presents the world with the gift of their talents. Merry Christmas to all!